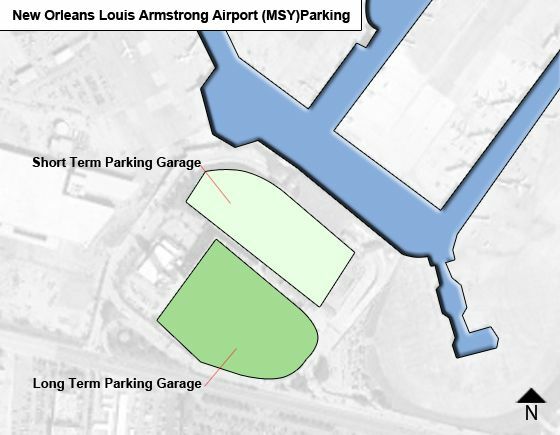 The Airport offers a 3,000 space short-term parking garage and a 2,500 long-term parking garage on site. Security guards are on duty 24-hours a day. Cell Phone Lot - at the corner of Airline Drive and Hollandey Street. This lot will allow you to park for up to 1 hour free until your passenger arrives and calls to say they are ready for pickup. Vehicles in this lot must be attended at all times. Payments Methods: By cash or credit card (MasterCard, Visa, Discover, and American Express). Ticketless Parking - Insert a credit card into the machine as you enter either garage. The computer will record your license plate and return your credit card to you. When you're ready to leave, pull up to any of the XPress Pay lanes and insert the same credit card. Your total cost will be calculated and a receipt printed at the exit. It's fast and easy. No need to wait in line for a cashier. For additional information, please contact New South Parking at (504) 464-0204. There is no map showing whee yhr cell phone lot is!